The rise of home values in Tallahassee has cooled off of late, mostly due to the foreclosures and short sales still clearing through the market. In fact, the average price per square foot of condominiums and townhouses are both on the decline right now, with evidence that many more foreclosure sales must occur before we put this trend behind us. But what about single family homes? Are they going to be pulled down with the rest of the Tallahassee real estate market? 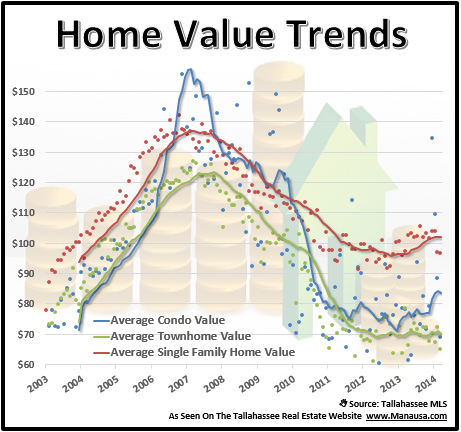 Our first real estate graph shows the one-year trend of home values for single family detached homes (red line), condominiums (blue line), and townhomes (green line). Additionally, monthly averages are plotted to show how these trend lines were formed. All three property types show recent sales below the trend. For example, notice how the last two red "dots" fall below the red line, and then notice how the previous red dots had all been above the red line. This is simply showing a change in direction for home values, where the past two months have been at levels more consistent with home values two years ago. One has to wonder whether this something to be concerned about or if it is merely a blip on the real estate radar. I believe our next real estate graph will give us a clue. We like to monitor the number of short sales, pre-foreclosures, and foreclosure sales that occur in the Tallahassee real estate market, as their percentage of the market will determine their impact on arms length home sales. This next graph shows arms length home sales each month (green bars), and distressed home sales each month (red bars). The resulting ratio of distressed home sales to all home sales is shown as a crimson line and is measured on the right vertical axis. 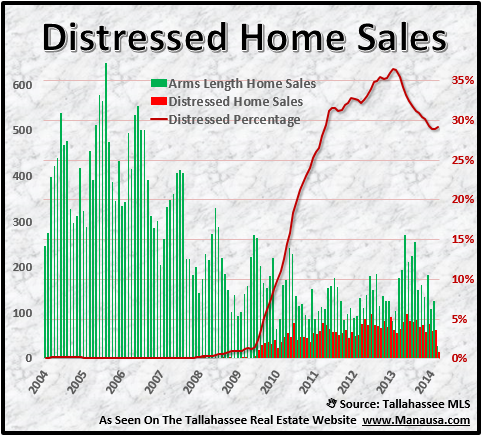 The graph clearly shows that the number of distressed properties spike upwards during the first two months of 2014, and I believe they are the reason why we see the significant decline in home values in Tallahassee. Each area and price range have their own version of the graphs above, and we drill down to neighborhood level when we help determine the true market value for a property. Do not use the information above to try to assess your property value, but you can use it to get a general feel for the current direction of home values. If you would like to know what your home is worth and the feasibility of getting it sold in today's market, just drop me a note and we will schedule a time to help you out.